definition of portfolio of technological projects. These steps are fundamental to definition of the content of a technology strategy i.e. the technological areas where investment should be made, and the technological projects to be selected. The process of technology assessment aims to collect information on the current and future state of technology development, to evaluate the importance of each technology in the competitive arena and the strength of the enterprise in each technology. The technologies are the set of technological knowledge and skills that have an impact on the overall competitive position of the enterprise in the marketplace, currently and in the future. support technologies i.e. those technologies used to perform a certain activity of the enterprise and not embodied in the enterprise's product or production process (typical support technologies are IT tools, software packages, networks). To support the identification of the enterprise's technologies, it may be helpful to map the technologies used in the activities of the enterprise's value chain, i.e. inbound logistics, outbound logistics, distribution, sales, after-sales service, customer relationship, supplier relationship, etc. Include in the assessment also those technologies that may have an impact in the future. These are often defined as emerging or pacing technologies, i.e. technologies not yet in use but whose potential could be significant in replacing technologies used in current products or in generating new products. To this end, technology forecasting techniques can be useful in identifying emerging technologies. This process leads to identification of the technologies that will form the unit of analysis of the formulation of enterprise technology strategy. The following table could be used to present a comprehensive summary of the assessed information concerning the enterprise's technologies, and also includes information on external sources of each technology. The result of this step is a detailed list of the technologies relevant to the enterprise's business. This analysis aims to evaluate the competitive importance of each technology and its relevance in sustaining the market competitive factors. the importance for future competition i.e. to what extent that competence will be critical in future competition. A useful tool could be the matrix shown in Table 2, where competitive factors are shown in relation to each. In the cells of the matrix, a score is given reflecting the impact of the specific technology on a specific competitive factor. A value scale from 1 to 5 where 1 means that the technology has no impact on the specific competitive factor, while 5 means that it is a critical input to meeting that factor. To obtain representative results, it is important to involve in this analysis personnel from different division and with different functions (sales, technical assistance, technicians, engineers, production, etc.) and, if possible, suppliers and customers. As a result of this analysis, it will be possible to detect the critical technologies (CT). These are the technologies with the strongest impact on the competitive factors. The competitive impact analysis provides an overall assessment of the competitive importance of each technology, supports the selection of the critical technologies for the business, and prioritizes them. The output of this exercise will be a list of critical technologies. 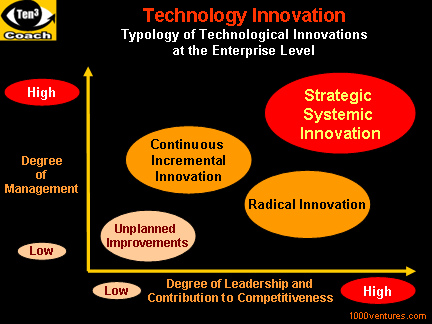 The technological capability assessment aims at defining the strength of the enterprise in each critical technology. This is achieved by evaluating an enterprise's technological capabilities for each critical technology against its major competitors. The evaluation can be carried out using a matrix that takes into account the strength and dimensions of the different variables in relation to the relevant technologies. The cells record a score value from 1 to 5, where 1 means very weak, 2 weak, 3 on the average, 4 mildly strong, and 5 strong. The evaluation of the strength of the enterprise in a specific technology can be then obtained qualitatively or by constructing a merit table as a weighted average. The managing director/top management, assisted by the enterprise's technical managers should lead this phase. development of new product for the product. The internal analysis provides an overall assessment of the strength of the enterprise in each technology.